There is no mention of online gambling in the criminal code of North Carolina. Even though this is not uncommon in most of the U.S state laws, which mostly have excerpts that could make computers and smartphones sort of illegal gambling devices, even that is not part of the law. North Carolina has also never arrested anyone for online gambling, which makes it safe for residents to play poker, casino games and place sports bets online. In North Carolina, the state is responsible for the regulating of gambling, which includes horse tracks and casinos. In most cases, the state law is relatively strict when it comes to casino gaming, except in the case of casinos run from Indian reservations, while the state does allow raffles and bingo sponsored by non-profit organisations. The North Carolina Gambling Law Article 37 define gambling as the playing or operating of games of change involving betting of property, money or anything else of value. Gambling-related activities banned by the state include chain or pyramid schemes, possession of gambling machines or tables and allowing gambling in-house as public entertainment. Casinos on Indian reservations are allowed and regulated by Tribal-State Gaming. At the same time, state laws are constantly changing and with the Supreme Court recently adjusting the 1992 federal law that banned all forms of sports betting across the U.S. several states took notice. With the American Gaming Association releasing statistics that over $150 billion is spent on illegal sports betting per year many states thought of the profits they could reap. States that started the process of legalising sports betting includes West Virginia, Delaware, Pennsylvania, and Mississippi, while the governor of Rhode Island counted on sports betting revenue in his 2019 budget proposal. New Jersey brought the sports betting case to the Supreme Court, and it took only weeks before sports betting was in full swing in the state. Gambling experts predict that the landscape for sports betting will change significantly within the next five years and it is likely that 32 states in the U.S, will be open to sports betting before then. The question remains, will North Caroline be one of those that liberates or updates its current laws? In Ohio, Hawaii, Alabama, and Alaska laws would need to be amended before sports betting could be legalised and only time will tell if North Carolina would do the same. In North Carolina, the state is known to have conservative attitudes towards gambling and several other things. The Senate leader says the state will look at its options although he is not predicting a change just yet, or rather he can’t see changes as early as this year. In North Carolina gambling is limited to casinos in Cherokee and the statewide lottery and its gambling statutes go back all the way to 1891. As stated by professor Welty, North Carolina have a long uninterrupted history of banning gambling, although the world is changing and therefore the law could be altered should the general assembly agrees to do so. The general most states already have a gaming infrastructure, which places those who allow racehorse betting and pari-mutual betting well ahead in the race. Unfortunately, it might be a tough sell in the state of North Caroline as many of the legislators believe the general assembly is everything but the right place and time to discuss gambling laws. The state representative, Harrison votes strongly against the legislation of gambling as she believes it preys on citizen’s addictions. Although, with nearby states such as South Carolina and Virginia legalising sports betting, North Carolina resident will take their money across state lines or simply place bets online. Arguments against the expansion of gambling laws taken into consideration by North Carolina is the studies that recently revealed that between 3 million to 5 million, of Americans, are gambling addicts. With these figures in hand, the state feels that the legalisation of sports betting will only increase the number of addicts. On the other hand, Brockman agrees that gambling legislation will have to take place, eventually since it is a multi-billion industry that could bring billions into the state, which are very much needed. Until then North Carolina will take into consideration the actions regarding gambling law changes that neighbouring states do, but it certainly doesn’t guarantee that they will change their mind as many feel that sports betting is not the golden ticket, it is simply a niche revenue generator. While it is clear that North Carolina plans to take a slower approach in the legalising of casinos and sports betting, there are many online casinos eager to accept players residing in this state. 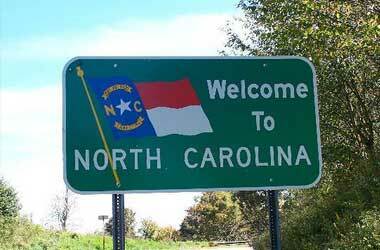 As a matter of fact, the race to accept new players from North Carolina is quite competitive, and therefore North Carolinians can take advantage of massive welcome bonuses. What is most important is that players join casinos with good reputations when it comes to fair gaming and fast payouts. We strongly recommend casinos that are U.K. Gambling Commission, Malta Gaming Authority of Government of Curacao regulated and licensed. Licensing details are displayed on online casino main pages at the bottom, which makes it easier to find a licensed online operator. Online casinos welcome new members with a 100% free bonus, which instantly doubles the initial deposit. By accepting a welcome package, new members can expect bonuses with their first three or up to five deposits, and very often the package also includes hundreds of free spins. This is only the start of bonus benefits at an online casino since the range of bonuses exclusive to members includes second change bonuses also called cashbacks, deposit bonuses, and free spins bonuses. Tournaments are another way of topping up your bankroll significantly, while loyalty rewards offered via point systems ensure ever increasing personalised bonuses, invites to VIP exclusive events and anniversary bonuses, while assistance is offered by dedicated VIP account managers. The betting options at online casinos are exciting broad, and players can enjoy games such as slots from a minimum bet of $0.01 per payline. Online casinos also cater for members with deep pockets, and therefore the betting options allow for bets worth hundreds or thousands of dollars. Online casinos cater to players from around the world and accept multiple currencies, while games can be enjoyed in several languages. The play of games at online casinos are all about high payouts offered via the most convenient ways, which is also true when it comes to depositing or withdrawals. Banking methods accepted at most online operators include debit cards, credit cards, e-wallets and many casinos are now cryptocurrency friendly. Online casinos offer players the option to choose how quickly they want their winnings since the payout periods greatly depend on the method selected by the member. Credit and debit card withdraws can take one up to three days, e-wallets are pretty fast and can take around one up to two days, while cryptocurrency payouts are instant or within a couple of hours at most online casinos.